A blog about old school D&D and other table top RPGs. 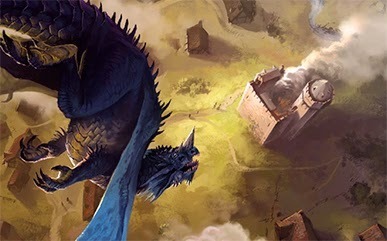 I'm late to the party on this one I know, as Tyranny of Dragons is sort of old news, but I've spent a lot of time DMing this campaign for my group over the past few months. 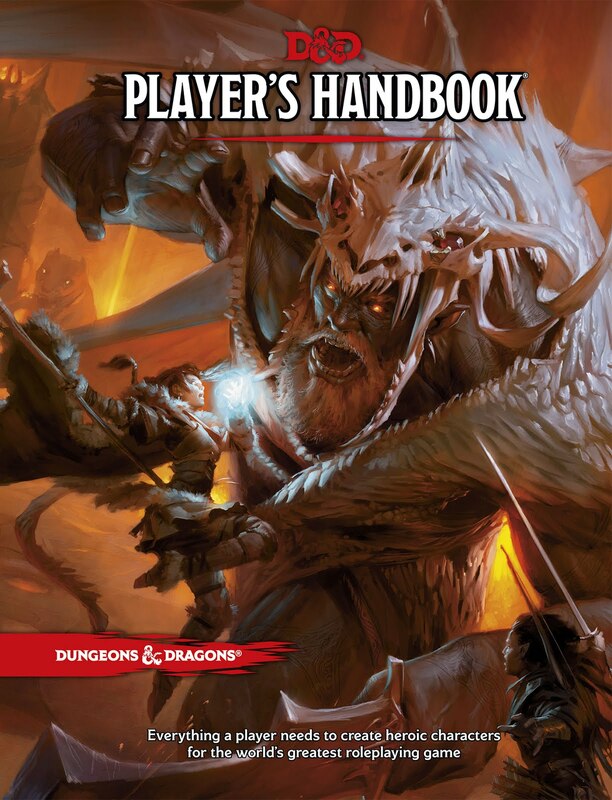 It served essentially as a starter for learning 5e for us. After having some extensive time with the book, and having run my players through the first half, I'm going to share my thoughts on the campaign. Let me preface this by saying I don't usually like to run pre-made adventures. I have spent many a game hopping around in Forgotten Realms playing in homebrew campaigns that weren't necessarily based on any module, and I haven't actually run a published adventure like Hoard of the Dragon Queen in probably two decades. That said, I appreciate published game material as I often use it for inspiration in my own games and campaign settings. 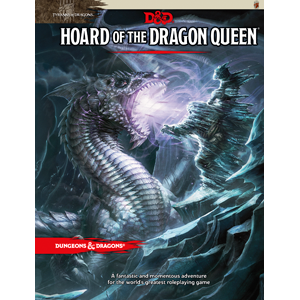 What is Hoard of the Dragon Queen all about? It is part one in a two part campaign centered around the Sword Coast region of Forgotten Realms and focusing on the Cult of the Dragon and their attempt to raise Tiamat from the hells into Faerun to basically ruin everyone's day. The heroes start out as lowly adventurers who, through the course of the campaign, become swept up into this huge epic plot and, by the end of the first book, become fairly well known adventurers. It's designed to take characters from 1st to 8th level. Wait is that a dragon destroying a village? You do realize we are 1st level right? The campaign kicks off with a bang as the party is basically wandering the open road seeking adventure when they stumble into a little village built around a small keep called Greenest. This village is being ravaged by a blue dragon and his little kobold cronies as well as some Cultists. Yes, that's right, a blue dragon right off the bat. Needless to say this made my players pucker a little bit, but fortunately, unless they just do something really foolish, the dragon is really a non-factor to the PCs. He just flies around destroying the town while the kobolds and cultists plunder and loot the village of whatever valuables it might have. From this point, the players are swept up into this epic campaign where they follow trail after trail and lead after lead trying to figure out exactly what the Cult is doing and why. Probably my biggest overall complaint with this module is that it is essentially a giant railroad storyline that doesn't give the PCs much (if any) flexibility to go on and do their own thing. Having now run the campaign, in hindsight, I probably wouldn't have done this campaign, but hindsight is 20/20 of course. As I said earlier, when we sat down to play we were sort of learning the mechanics of 5e and I felt this module would serve as a good springboard for how to DM 5e mechanically speaking. It does an ok job of that, but not great. More on that later. One thing I did like about this campaign was the way that XP is handled. Basically, as the heroes complete the chapters, they level. I know a lot of people will roll their eyes at this, but I really don't like keeping up with experience points and tracking it. So, a storyline goal system was perfect to me for this game. I knew based on what chapter the PCs were going into, what level they should be. It really didn't stay that way though. Mainly due to side quests. Which leads to my next point. This campaign takes the characters from as far south as Eltural all along the Sword Coast, through Baldur's Gate, and up into Waterdeep. That's a lot of distance to cover. The book basically gives you two options: The whole "you travel for two weeks and arrive at city X" or it lets you handle travel the way any D&D game should, where the game is just as much about the journey as it is the destination, which opens up the game for a lot of side quests. Which is good, only they don't really give you much help in that department. So, since I refuse to cop out to the whole "you travel along and you're there" approach, I was forced to come up with a lot of my own random encounters and side quests for the game. I find that a bit frustrating because at one point, we were spending multiple sessions off on this side quest I had created which wasn't really even relevant to the main plot. Don't get me wrong, side quests are awesome, and it gave me some opportunity to flex my creativity in dealing with it, but it's frustrating when you buy a published module and they cop out the travel to "ok you're there." Not to mention, it really messes up the whole "storyline goal" xp system if the characters spend 2 months traveling on the road with a merchant caravan dealing with random encounters, or in Baldur's Gate for 2 weeks waiting for the cultists to arrive so you can trail them to Waterdeep. There was a point where I really couldn't ignore giving the players xp and letting them level up. When you spend 4 or 5 sessions on a side quest because you're waiting for cultists to arrive in the city, the players start getting a little edgy when they don't get to level up. And they shouldn't be "punished" for adventuring because they are waiting to complete a main quest goal that they really can't interact with. So, naturally I let them level up when appropriate which made a few of the encounters in the middle of the book's main quests a little too easy. To the designer's credit, there is a point when the party goes on a long caravan ride from Baldur's Gate to Waterdeep and they do present an interesting assortment of NPCs along for the journey which I used. That leads to my second complaint here; balance in the module. Ok, make no mistake, when I DM my own game worlds "balance" isn't a thing. 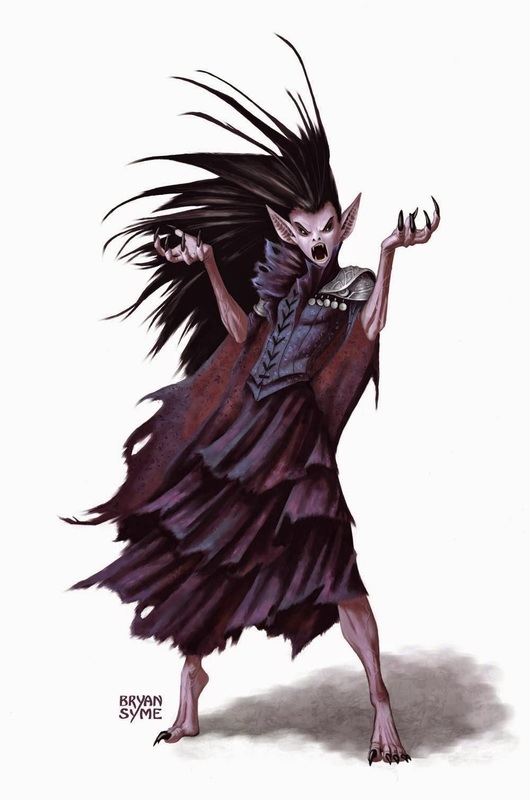 You're probably just as likely to bump into a group of trolls as you are goblins or kobolds if you go wandering in the wilderness for too long at 1st level. I don't believe in scaling back because it makes the game more real and gives the players a sense that they're not just going to beat every encounter they are faced with. There are some encounters you just can't "win" per se. With a published adventure, however, you expect the encounters to be balanced to the party's level. That's why they have the whole "storyline goal" xp thing right? Well, it doesn't always work out that way. For example, when the party is low in level they are faced with a couple of berserkers whose profiles are laid out in the Monster Manual with a crap ton of hit points, advantage on attack rolls, and a pretty tough AC for low level PCs to try and hit. Yeah, if I throw my party against those guys at like 2nd level there will be a TPK. So, I scaled them down a bit to have less hit points and a lower AC so the party would survive. There are a few of these types of scenarios present throughout the book. Which leads to the next point; nonsensical plots. The cult openly attacks a small village, yet their activity as a whole is supposed to be clandestine and secret. So, the cult leaders are dumbasses. Hey, let's raise Tiamat in secret by openly raiding villages all along the Sword Coast in full cult of the Dragon livery! The Harpers will never figure it out! We'll just dress as brigands when we're in our own camp. Also, the flying cloud giant castle? There's a cloud giant flying around a white dragon in his castle along with the cultists helping them move their stolen treasures from one point to another even though it specifically points out that cloud giants hate dragons and war with them. The reasoning behind the giant's aid to the cult is completely ridiculous. Also, there is a vampire there (why?) Not to mention the whole "Dragon masks" thing. The PCs find out through the course of the adventure that the Cult has these high ranking members called Wyrmspeakers and each one of them has a mask corresponding to the chromatic dragon they can influence. The main villain of the first book is the Wyrmspeaker Rezmir who has a black dragon mask. 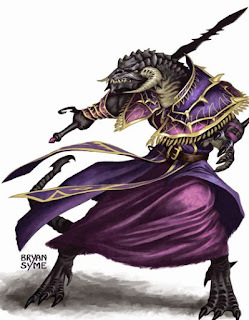 And somewhere in all this, the cult's plans hinge on uniting all of the chromatic masks into one super powerful artifact which they require to raise Tiamat, however by the end of the first campaign the party should kill Rezmir and thus take her mask. Ok, the cult needs all the masks to raise Tiamat and they can't do it without the masks. We have one of them. Let's destroy it. Cult fails and campaign over and we all go back to the pub. I had to make a contingency for this which I felt was lame which was essentially, the mask vanishes from your possession teleported away. I hated to do that, as I felt it really robbed the players of a big accomplishment, but that was because I knew that somehow, in the second book Tiamat does get raised. If they need the masks to do that, which the first book leads you to believe with no option otherwise, then you're sort of stuck with having to do something cheesy like that to take it from the PCs. Don't take my mask, bro! Overall, I felt the story wasn't very compelling and in fact, when the players reflect back on the campaign, they always mention the stuff that they did in side quests or while traveling that I made up for them with fondness rather than anything related to the actual story of the campaign's main plot line. As far as the layout of the book goes, it does a decent job going from chapter to chapter providing mostly interesting scenarios and encounters for the party, albeit some completely nonsensical. We particularly enjoyed the chapter with the ruined castle in the Mire of Dead Men. Dealing with the factions of the Bullywugs and the lizard men and getting them to work against each other was a nice twist. Although that in of itself was nonsensical too. Why would the Cult get two rival races to attempt to work together? Bullywugs hate Lizardfolk and vice versa. Wouldn't it have made more sense just to employ one over the other rather than have them working side by side? The art and maps in the book are very well done for the most part, although I found the cloud giant castle map a bit cumbersome and difficult to read. But there are a ton of interesting maps within it's pages. It would have been nice to have had a bit more to go on for the cities in the adventure. There is not much given detailing Baldur's Gate in this time period which required me to go on my own to research online. No map of the city is included either which was frustrating. Yes, there are plenty of maps out there of Baldur's Gate, but the point is if I purchase a published module I shouldn't have to go scouring the internet for a map of a well known city the party is supposed to linger in for 2 weeks. Overall, I'd give the book 3 out of 5 stars. Now that 5e has been around for a couple of years there are plenty of better jumping off points like Princes of the Apocalypse or Out of the Abyss, both of which are really well done from my understanding. Not to mention the 3rd party stuff that's beginning to sprout up with the release of the OGL for 5e. Honestly unless you just really have a thing for dragons, I would pass on Tyranny of Dragons as a whole. It's fairly mediocre and there are plenty of better campaigns out there to begin your leap into 5e.